Meet the Brotherhood-Eddie Jacobson B’nai B’rith bowling league champions. From left are Matt Rappaport, Ben Shapiro, Gary Klinger and Aubrey Topper. 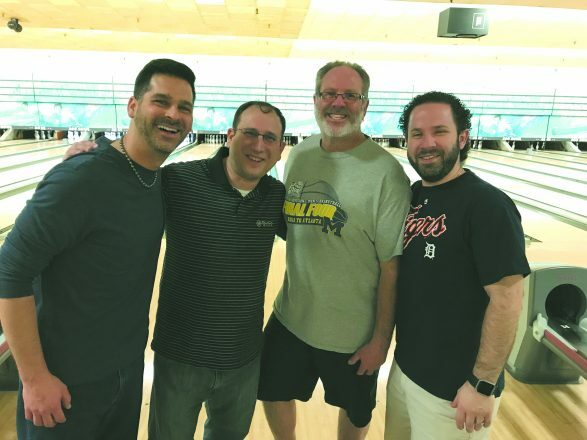 The Brotherhood-Eddie Jacobson B’nai B’rith bowling league has been competing weekly at Country Lanes in Farmington Hills since 1986. But the league had to find a new home — quickly — late this season when Country Lanes closed for about a month following the sudden death of its owner. The league moved to 300 Bowl in Waterford Township, “mostly because it was available,” said league spokesman Gary Klinger. The final week of the regular season and the three weeks of playoffs were bowled at 300 Bowl. Klinger’s team won the league championship for the second straight season, rolling past the five other teams that made the playoffs. Matt Rappaport, Ben Shapiro and Aubrey Topper are Klinger’s teammates. Their team name this season was Neinandtenn, an homage to winning the league title in 2017 on lanes 9 and 10 at Country Lanes. The team called itself Kling and His Court in 2017. Fast-pitch softball fans may remember the famous King and His Court, a four-man team featuring pitching great Eddie “The King” Feigner that beat full teams across the country from the late 1940s to the early 21st century. There were 18 teams in the Brotherhood-Eddie Jacobson league this season, divided once again into four divisions. The season is divided into two halves. The winner of each division in each half of the season earns a berth in the playoffs. Because two teams won both halves in their division this year, only six teams made it to the postseason. Neinandtenn won the Red Wings Division championship in both halves, and the Dream Team won the Pistons Division championship in both halves. Each team earned a bye in the playoff quarterfinals. House Balls and Older Than Dirt were the first- and second-half winners in the Lions Division. Ten Pin Commandments and Mix ‘n’ Match were the first- and second-half champions in the Tigers Division. After its bye, Neinandtenn defeated the House Balls 17-7 in the playoff semifinals. Ten Pin Commandments beat the Dream Team 14-10 in the other semifinal match. It came down to Neinandtenn vs. Ten Pin Commandments in the championship match April 30 and Neinandtenn won 18-6. This was the fourth year the team was together. Emory University freshman pitcher Jacqueline Spizizen from West Bloomfield came on in relief May 12 and earned the victory in her team’s 4-2 win over Lynchburg in an elimination game of the Atlanta Regional in the NCAA Division III softball tournament. Spizizen relieved Emory starter Madison Schaefer in the second inning and didn’t give a run the rest of the game. She allowed seven hits and fanned six in six innings. Down 2-0, Emory (29-11) scored four unanswered runs including two in the top of the seventh that broke a 2-2 tie. Lynchburg (30-14) had two runners on base in the bottom of the seventh when Spizizen, a Detroit Country Day School graduate, struck out the final batter.